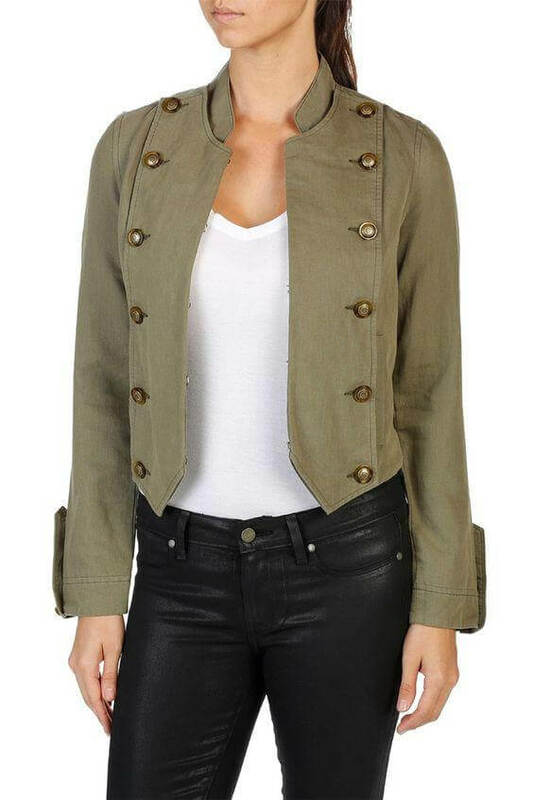 Many girls and guys do not add a military-style jacket to their fashion wardrobe because they fear a general-like look—that is a misconception. 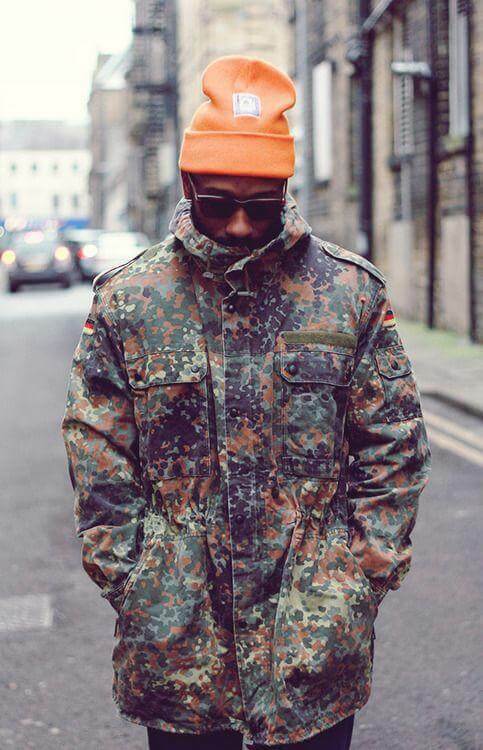 Military jackets are one of the hottest street style trends in winter. The promised look is much better than a normal bomber jacket. A few elements that elevate army topper over others include—a crisp look with strong shoulders, rope trim, an addition of epaulets and above all those brass buttons. Just scroll down to style it perfectly (for both genders). Even the everyday look that we usually pull off, can be made stylish by adding a well-fit military style jacket with army print. Pairing it with a flirty denim balances your whole look and keeps you from getting a bored look. Don’t forget to pair it with some funky shoes. A few years back, pairing a heavy duty military jacket with a trouser might be an impossible thing for a common person. But things are changing today. 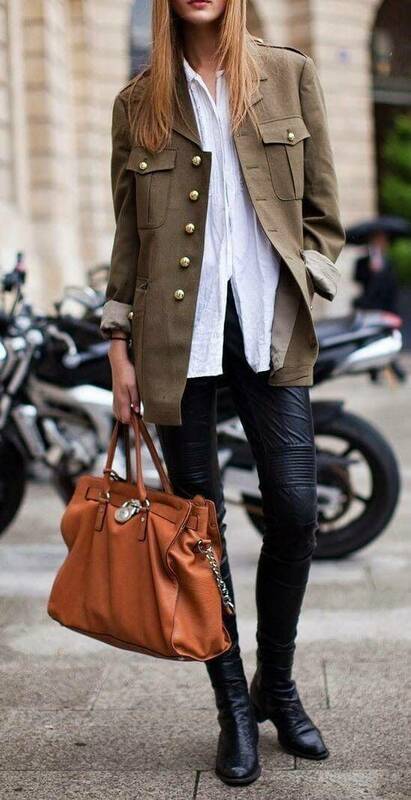 Girls who are looking for a jazzed up look in winter, must consider wearing military style jacket with a leather pant. For footwear, ankle boots complement the whole look. Just give a look to this comfy and stylish oversized military jacket. Solid construction and buttoned accents make you look like a fashion faithful. It can be worn with anything that you want, but for a chicer appeal, pair it with a small black dress. Clashing colors draw everyone’s attention towards you. Are you looking for something with a flair of vintage plus modern look? 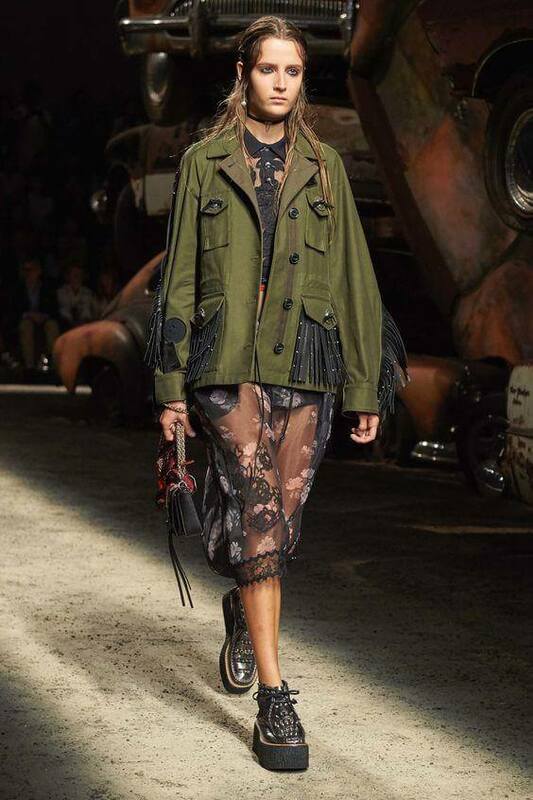 How about trying a short body or cropped military jacket? Close-fitting style and cropped hem tend to give you a slimming and sassy look. This style is best paired with skinny trousers. The days when you are welcoming spring, you need a thin layer to put on. 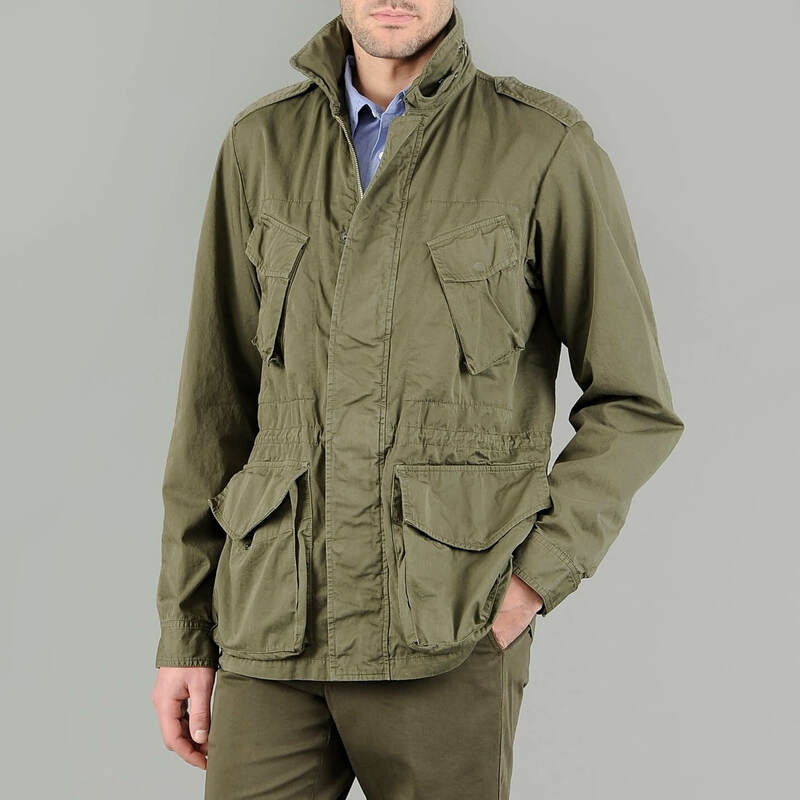 Lightweight army jackets not only protect you against the super breezy days but the addition of epaulets and snap pockets tend to add a classic cargo vibe to your whole outfit. If you are fearing a boring look resulted from the earthy toned military jackets, add a pretty pop of color with some colored military piece. Beige and grey are the most common colors. Colored military jackets are not too common—but still they promise a flattering style. How about trying one? Skipping the traditional-collard look is yet another innovative idea. This one is also comfier than the ones with collars. When it comes to pairing it up, it suits best with floral sundresses and tank tops. For a casual and everyday look, simply layer up any outfit with a jacket with boxy silhouette. Dropped shoulders style is enough to give you a standout look. Are you looking for a layering item that is more fitted and figure flattering? Belted military jackets or the ones with drawstrings are the way to go. Belting up helps in shaping up a disfigured waistline. 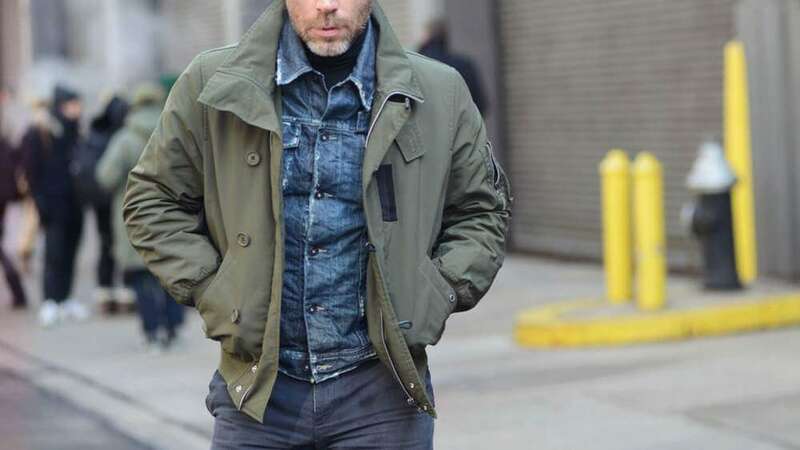 Military jacket is a utilitarian staple that is often considered rough and boring. If you too believe so, just give a try to a piece with feminine elements like laced or fringed detailing. Step out in style with the promise of remarkable comfort. When it comes to men, the basic rule is to prefer wearing the conventional and earthy tones like—khaki, olive, brown, green and sand. These muted tones add more to your manliness (that is something all men aspire). Secondly, for the colder months of autumn, these shades are the best option to settle on. 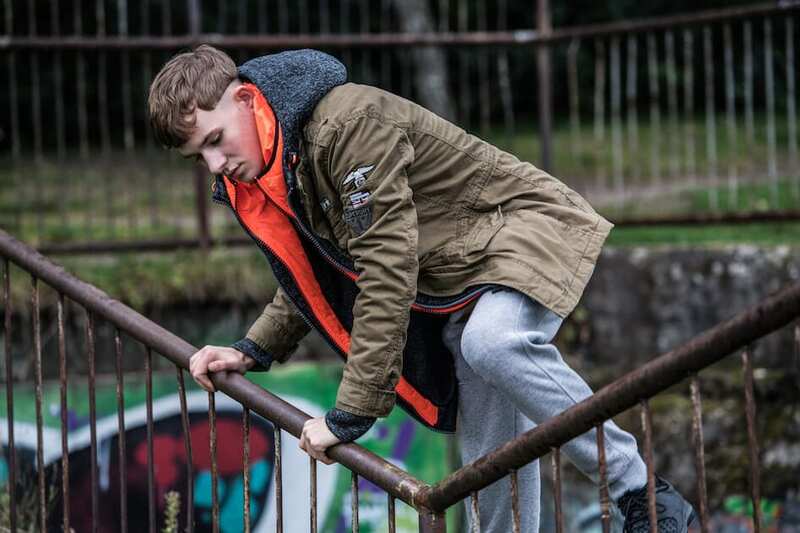 For braving the harshly cold weather in autumn, parka style can save the day. The unique points associated with parka jackets include; the length, the inside layer of fleece and the hood that promises to keep you warm. 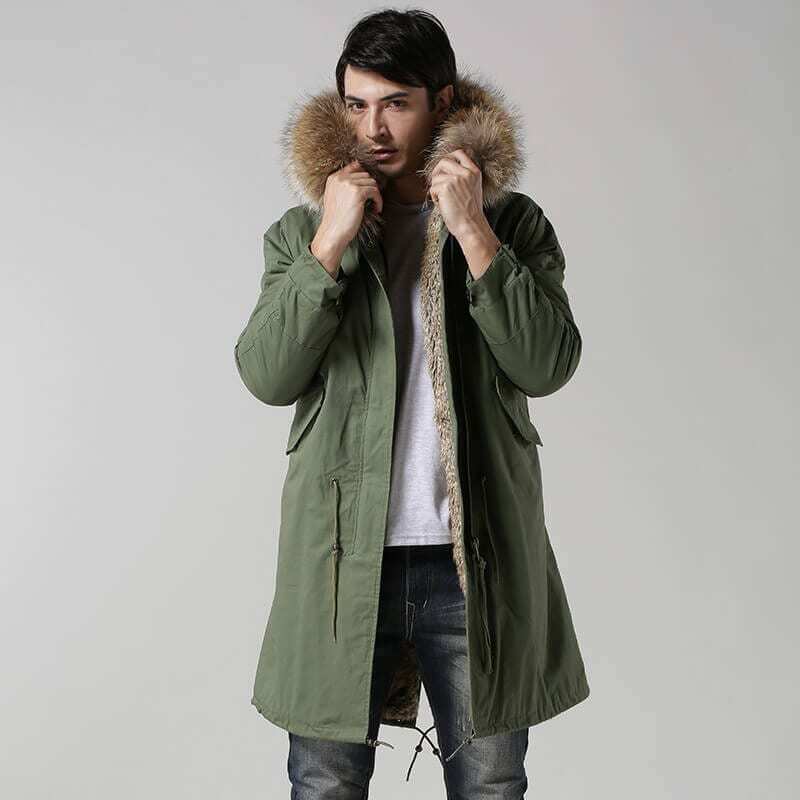 Parka style jackets are more suited with casual and comfy staples. 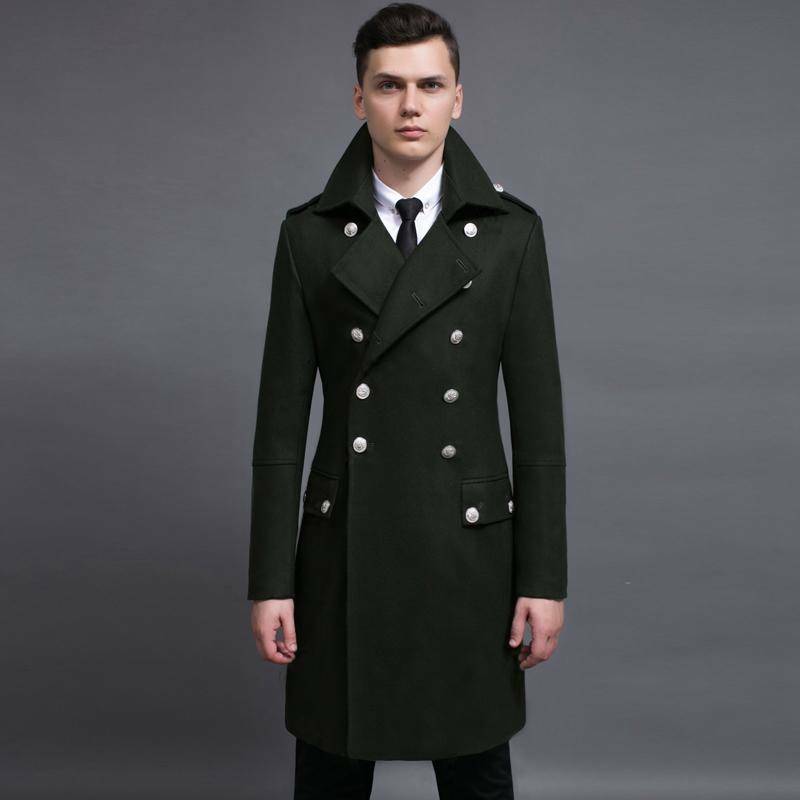 With solid construction, a military-inspired pea coat promises an appealing sense of style. Storm collars and double-breasted front makes it a winter-special staple. When it comes to styling it up, you are in luck as it can easily be teamed up with chinos, jeans and formal trousers. When winter is on the verge of change and we are about to welcome the spring, we like to pull off some comfy and lightweight staple—field jackets are the best. Boxy hemline with lots of pockets takes us back in the vintage era, where it all started off. For pairing it up, opt for the low-key items like T-shirts, casual shirts, denim or some chic piece of knitwear. For footwear, sneaker style shoes are sure to get you noticed. Remembering these camouflage prints as the legacy of Napoleon Bonaparte would not be wrong. Army print jackets are more about being casual and sporty. It might be tried while having fun on weekends or on a day off when you do nothing but laying back on the couch. It is best paired with denim trousers or a denim shorts. If you are planning to become the attention-grabber of the day, forget about the mens military jacket green or in any other earthy tone. To add the vibe of liveliness, just settle on a jacket with some print detailing—a plethora of prints are at hand. Just go with the one that seems right with the occasion and style of the person. The most common style of all military-inspired jackets, bomber jackets are short-bodied with less pockets and no epaulets. It gives a sporty vibe, so we would recommend you to pair it with some denim trousers. Bomber jackets are available in a number of hues, those who want to stick with the conventional military look, must give a try to olive green jackets. Our list of military-inspired jackets cannot be completed without a perfect piece of vintage clothing—jungle jacket. What makes it unique is the lightweight fabric, no epaulets and slanted breast pockets. 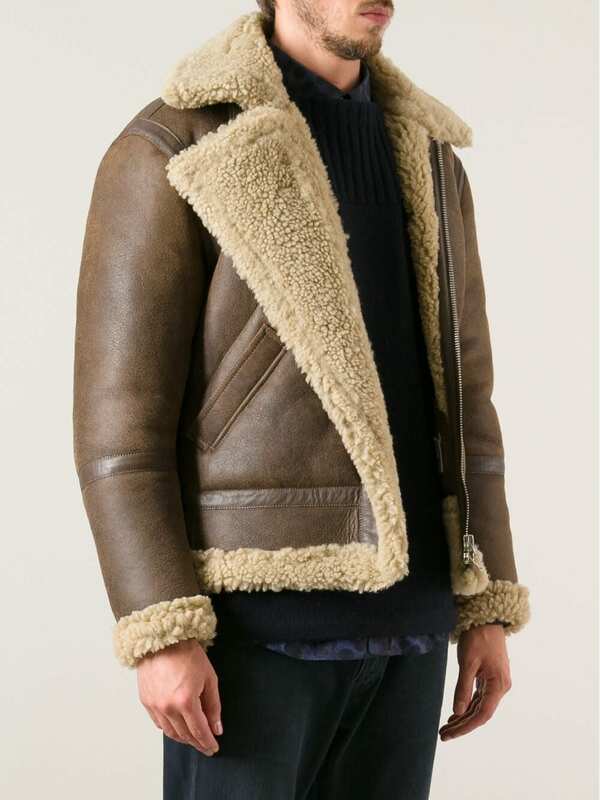 Though the history of shearling jackets goes back to the days of old Britain, even today, shearling jackets are one of the best winter staples for men. What makes them unique is elasticated cuffs and fur-lined collar (which makes it ideal for freezing weather. The combo of this utilitarian style with today’s advanced and sultry trends can bring about some really advanced fashion looks. Military jackets trend is here to stay. All you need is to switch up your look with a bevy of textures, colors and styles. I really hope that the inspirations whittle down above would have been great help for our readers (male and female). Believe me, with a wee bit of innovation, you can keep yourself from becoming a fashion freak.